— significantly lower than other primary cities. DUBAI: The holy city of Makkah is set to see a sharp increase in the number of retail malls and outlets to cater for a projected boom of pilgrims making the annual Hajj. They are expected to increase by more than 200 percent by 2030. Shopping mall supply is likely to increase from about 280,000 to 338,000 sq meters in 2020 and to 804,000 sq m by 2025 — a rise of almost 200 percent, according to new research published by real estate advisory firm Colliers International as Makkah looks to capitalize on the boom of international visitors over the next decade. Imad Damrah, managing director of Colliers International KSA, said Makkah is going through a major strategic development phase to improve connectivity, increase capacity, and enhance the experience of Umrah and Hajj pilgrims throughout their stay. There are several strategic infrastructure and transportation projects, including the Holy Haram Expansion, Haramain High-Speed Railway, and King Abdulaziz International Airport. However, the holy city’s retail sector at present is “untapped” and offers huge potential for investors. pilgrims and 1.7 Hajj pilgrims). The city has much lower shopping mall density than neighboring Madinah, even though Makkah has a larger population base, a higher number of visits from international pilgrims, and shares similar demographic and income-level structure, said Damrah. About 77 percent of Makkah’s retail supply is fragmented, said Damrah, comprising traditional souqs and line shops, whereas showrooms and organized retail (i.e. shopping malls) account for the remaining 23 percent. 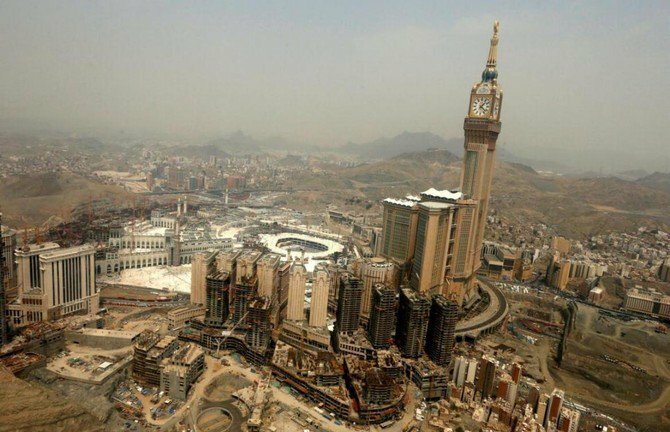 While there are challenges facing investment in Makkah — chiefly the shortage of suitable land plots, high land prices, high infrastructure cost given the holy city’s mountainous topography, and an existing preference of residents to shop in Jeddah, coupled with the completion of major infrastructure projects and a projected rise in Makkah’s population of 25 percent over the next 15 years — the holy city is prime for investment. Developers and retailers are taking note, said Damrah, highlighting several key retail developments including the remaining phases of Jabal Omar, shopping malls within the King Abdul Aziz Road Development, Muzdifah Mall by Al-Hokair Group, and Abraj Kudai, a hotel currently under construction in Makkah. However, it warned that future shopping developments needed to offer more diversity to compete with other cities in the Kingdom such as as Jeddah, King Abdullah Economic City and Madinah. Saudi Arabia has banned Palestinians holding temporary Jordanian passports from entering the country, effectively barring hundreds of thousands of people from undertaking the Hajj and Umrah pilgrimages, heads of tourist companies in Palestine and Jordan have confirmed to Middle East Eye. Several travel agents spoken to by MEE said they had been told at the start of this month that they should not apply for visas for anyone seeking to travel on a temporary Jordanian passport, although no official announcement has been made. The measure directly affects almost 634,000 Palestinians living in Jordan and Israeli-occupied East Jerusalem, who have no access to any other form of travel document allowing them to go to Saudi Arabia, where millions of Muslims travel each year on pilgrimage to the holy cities of Mecca and Medina. Palestinian refugees from the Gaza Strip who live in Jordan, estimated to number around 150,000, are also issued the temporary passports, while Palestinians living in the Israeli-occupied West Bank are legally entitled to apply for one also. The holder of a temporary passport does not have a national identification number and is therefore not entitled to the full rights of Jordanian citizenship. Kamal Abu Dhiab, the head of the Jordan Society of Tourism and Travel Agents, told MEE that the organisation had been informed "verbally over the phone" of the measure by the Saudi consulate in Amman. "I can confirm that they informed us not to send any Jordanian temporary passports to get a visa. The Saudi consulate informed us recently, and their message was not written but verbal," Abu Dhiab said. 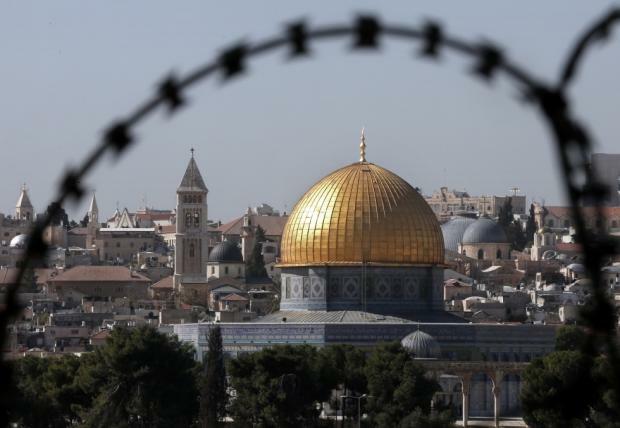 Abu Khaled al-Jimzawi, the owner of the al-Odeh Office for Tourism in East Jerusalem, said that he had been informed of the decision by the Palestinian Ministry of Awqaf and Religious Affairs in Ramallah, the administrative capital of the Palestinian Authority-run West Bank. "We were informed of the decision at the beginning of September. They [the Saudi authorities] have informed Palestinian and Jordanian tourist companies and the Palestinian Ministry of Awqaf that they will refuse to issue visas for any temporary passport that has no national number," Jimzawi said. Palestinians in East Jerusalem are being encouraged instead to apply for passports issued by the PA, the owner of an Umrah and Hajj travel agency told MEE, speaking on condition of anonymity for fear of losing his contract with the Saudi Ministry of Hajj and Umrah. Tourist companies in Jordan and Palestine must abide by legal contracts with the Saudi Ministry of Hajj and Umrah. Registered companies require a username and a passport from the ministry that allow them to apply for visas and upload documents online. According to the travel agent, the PA passport will cost Palestinians 240 shekels ($65), be valid for one year only and take a day to be processed. "Palestinians in Jerusalem are afraid of the repercussions of this decision. If they apply for a document issued by the PA, they are afraid their legal status and residence in Jerusalem could be put in jeopardy," he said. Israel occupied East Jerusalem in the 1967 Middle East war, and has since attempted to annex it in a move never recognised by the international community. Palestinians who remained in the city and their descendants are under Israeli law recognised as East Jerusalem residents. But this status is often revoked by Israel for a myriad of reasons - such as dual nationality. It is unclear if passports issued for Palestinians in East Jerusalem by the PA will have a national number. If so, it could potentially allow Israel's interior ministry to revoke their Jerusalem residency rights and expel them as foreign nationals under the 1952 "Entry to Israel" law. However, an official who works for the Palestinian cabinet, speaking on condition of anonymity, denied that the PA would issue passports to East Jerusalem residents who hold Israeli identity cards, saying that its policy is not to issue documents to Palestinians from East Jerusalem even if their ID cards are revoked by Israel. Saudi embassies in London and Amman and the Ministry of Hajj and Umrah did not reply to MEE requests for comment. Jumana Ghunaimat, Jordan's minister of state for media affairs, told MEE that she was not aware of any new directives to cease issuing visas to Palestinians holding temporary Jordanian passports, and said that "no official announcement has been made". Dhiab, the head of the Jordan Society of Tourism and Travel Agents, said the reasons for the rule change were not clear, adding that Saudi Arabia regularly made changes to the visa requirements and regulations. He cited the sudden introduction in 2016 of a new policy which required anyone visiting Mecca twice within a two-year period to pay a fee of 2,000 Saudi riyals ($533), and a directive issued in 2011 requiring Jordanians to carry biometric passports. About 6,600 people from East Jerusalem, the West Bank and the Gaza Strip travelled to Saudi Arabia on Hajj in 2017, while an average of 50,000-70,000 people from the same areas undertake the Umrah pilgrimage annually. Before 1996, all Palestinians in the West Bank and East Jerusalem were granted Hajj and Umrah visas on their Jordanian temporary passports, except for Palestinians in the Gaza Strip who could apply for Egyptian travel documents. But after the Oslo Accords between Israel and the Palestine Liberation Organisation, which established the Palestinian Authority, Palestinians in the West Bank and the Gaza Strip started getting their visas in passports issued by the PA.
East Jerusalem residents continued to use temporary Jordanian passports, a legacy of the status of Jordan's Hashemite ruling dynasty as custodians of Jerusalem's holy sites and the Jordanian annexation of the West Bank and East Jerusalem until their occupation by Israel in 1967. Some Palestinian and Arab media have linked the Saudi move to US President Donald Trump's as-yet-unannounced "deal of the century" proposal, amid rumours that Washington sought Saudi support for measures that would revoke the right of return of Palestinian refugees displaced by the creation of Israel in 1948 and subsequent Middle Eastern wars. The measures would see Palestinian refugees in Lebanon - of which there are an estimated 173,000 - and Jordan fully naturalised and granted national ID numbers. Palestinians in East Jerusalem could apply for an Israeli passport, reports said. Israeli politicians have also expressed a wish for custodianship of the Jerusalem holy sites to be switched from the Hashemite dynasty to Saudi Arabia. 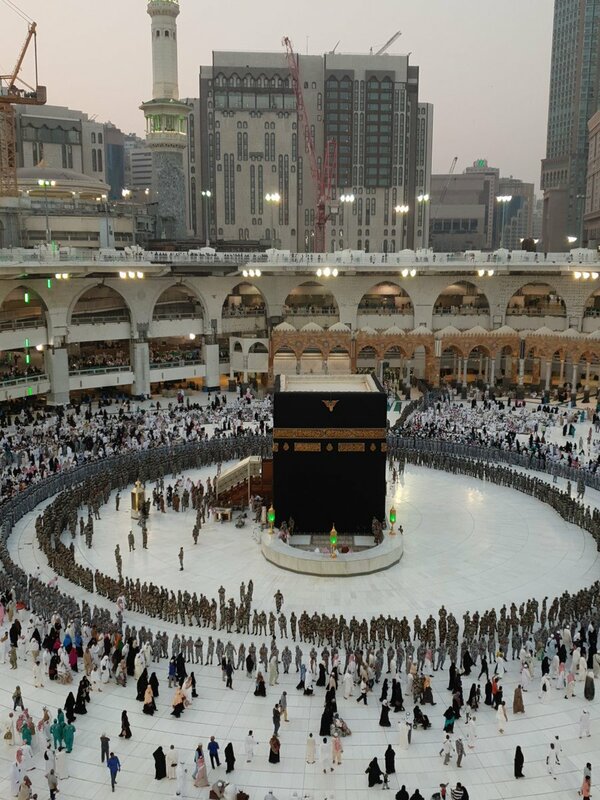 not sure they got enough guards around the kabah. Are you suggesting that they are guarding the Ka'ba? I reckon it's security for the high profile personnel! Ahmed ibn Hanbal said, "If in any matter there is agreement between three people, then one pays no attention to the verdict of anyone who disagrees with them." Someone asked him, "Who are they?" He answered, "Abu Hanifah, Abu Yusuf and Muhammad ibn al-Hasan. JEDDAH: The number of Umrah visas issued this year has reached 421,411 of which 181,690 pilgrims have arrived in the Kingdom, according to data provided by the Hajj and Umrah Ministry. They'll simply pass the quota to another country and maintain their numbers, Allahu Alum. what they do is up to them we can only do whats in our control. your analogy is same 'bojo the clown' used when asked why they sell arms to saudia he said if we dont russia will. also i think moazzams idea is ALL nations boycott it. maybe it the UK muslims lead by example other muslim nations may follow. According to a media report, the PM, during his visit to the Kingdom, had requested Saudi Crown Prince Mohammad bin Salman Al Saud to abolish the fee. However, this fee was abolished on the request of Egypt and Turkey, the official added. The prime minister, he said, took up the matter with Saudi authorities and they agreed to waive it off and it was just a matter of time when they notify the policy. The situation could improve through open airline tendering. He said that due to restriction of CAA, the Ministry can’t go for open airline tendering right now. Regarding Shaheen Airlines issue, he said the Ministry has written a letter to CAA to black list Shaheen Airlines. The ministry has also asked the concerned authorities to put the names of management of Shaheen Airline on Exit Control List (ECL). He said Shaheen Air was given the load of 30,526 hujjaj from different places of departure (PODs) for Hajj 2018 and as per agreement, the first instalment of 35 percent advance amounting to Rs 960,6912,00, was released to SAI out of a total of Rs 2,744,832,000. 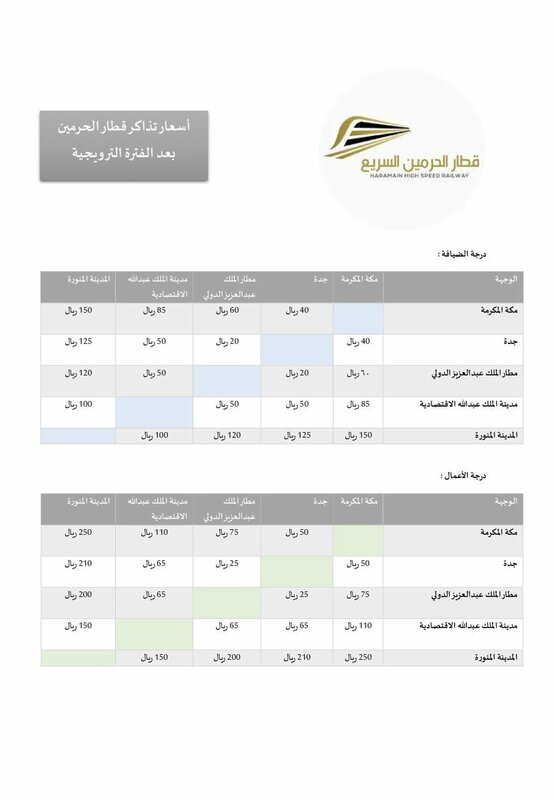 Shaheen Airline failed to provide the final flight schedule in given time period; as a result, the load of SAI was distributed amongst other airlines due to time constraint. Responding to a question, he said no other airline except SAI was ready to airlift 5,000 hujjaj from Quetta airport. The ministry suffered an additional loss of Rs 184,230,000. Shaheen Air International completely failed to act as per agreement. Shaheen Airlines did not have aircraft to land at Quetta Airport, he told. The Committee directed the Ministry to ensure distribution of Zakat share of erstwhile Federally Administered Tribal Areas (FATA) on priority basis. JEDDAH/MAKKAH — Saudi authorities have intensified their crackdown on unauthorized production and sale of souvenirs representing religious symbols. The officials had previously notified the shops about a ban on the sale such items. Millions of pilgrims who visit Makkah buy souvenirs to take home as gifts to near and dear ones and also to preserve the memory of their visit to the holy city. Making and selling souvenirs to the pilgrims is lucrative business, which is dominated by expatriate workers. The authorities have lately turned their attention to unauthorized manufacturing of souvenir items representing important religious symbols including the Holy Kaaba. 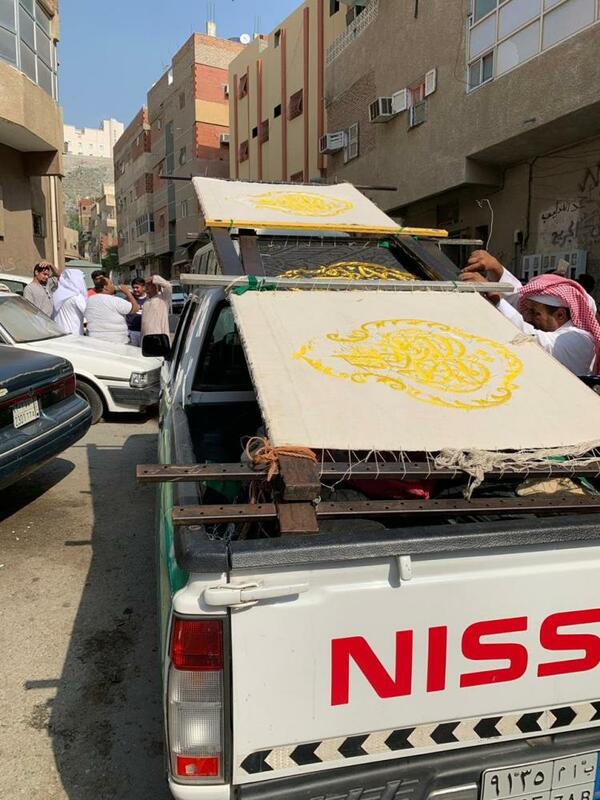 On Monday, officials from Makkah Municipality, with support from security forces, raided a sewing facility that skillfully produced embroidered cloth that looked like the pieces of the kiswa (the black and gold cover) of the Holy Kaaba. They arrested 20 expatriate craftsmen of various nationalities from the location. The expatriate workers had turned their residence in Al-Otaibiyah neighborhood of the city into an illegal factory for sewing the fake kiswa and other souvenir items. The officials, accompanied by police, stormed the building after the municipality was tipped off about the illegal activity by citizens. The officials also confiscated 18 powered sewing machines, 5 embroidery machines and other equipment along with a huge quantity of cloth, according to a statement issued by the municipality. During the raid, the officials seized pieces of black silk cloth with Qur’an verses embroidered into them with golden threads to make them look as if they are pieces of the Kaaba kiswa. Skilled craftsmen from Bangladesh, India and Burma worked in the factory. Apparently, they were trying to make money by selling the cloth pieces to unsuspecting pilgrims, who would be eager to buy them believing them to be pieces of the Kaaba cover. The Holy Kaaba represents the Qibla, or the direction in which Muslims all around the world face when performing the prayer. The cover of the Kaaba is one of the most important symbols of veneration in the House of Allah. 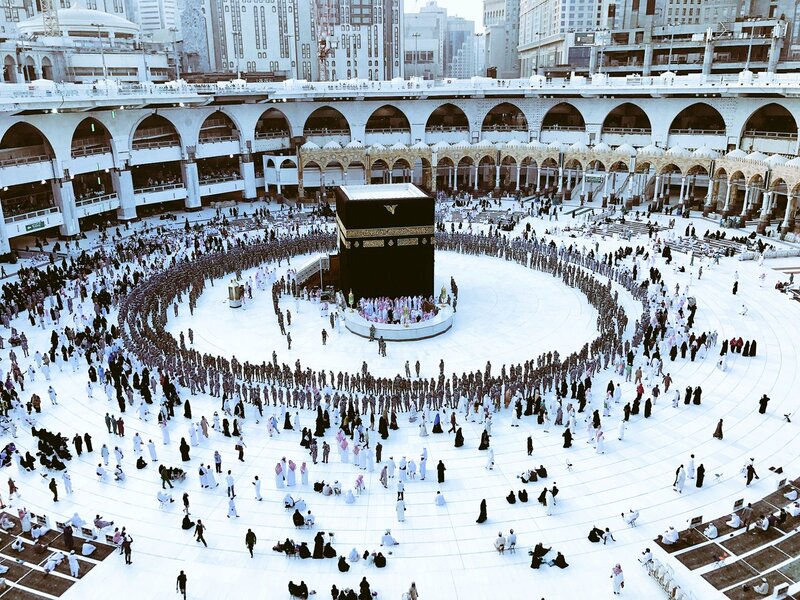 Its history is as much a part of the history of the Kaaba itself. The form and design of the kiswa evolved due to numerous social and economic factors in particular periods of history. 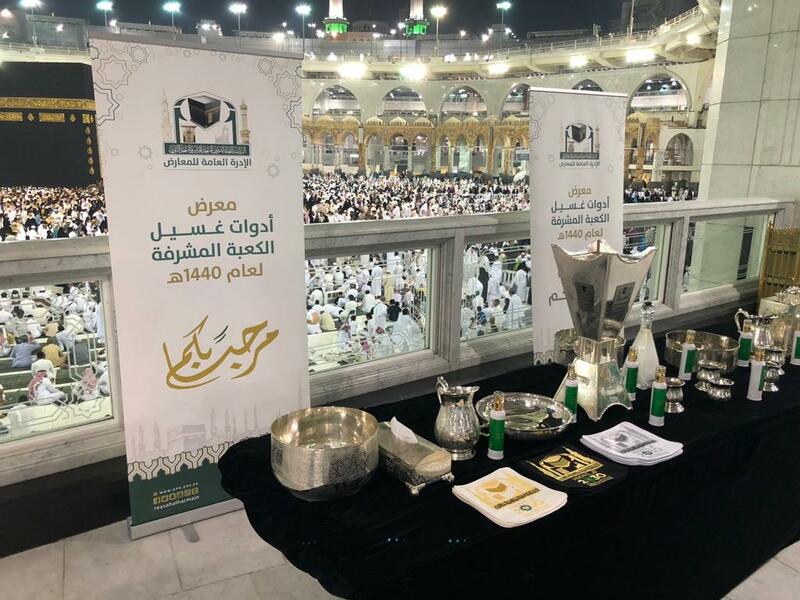 When the kiswa is replaced with a new one as is customary on Dhul Hijjah 9 every year, the old kiswa is cut into pieces and presented to important dignitaries from around the world as souvenirs. One such piece is preserved in the United Nations. Municipality officials remove equipment seized from the illegal souvenir factory in Al-Otaibiya area of Makkah. 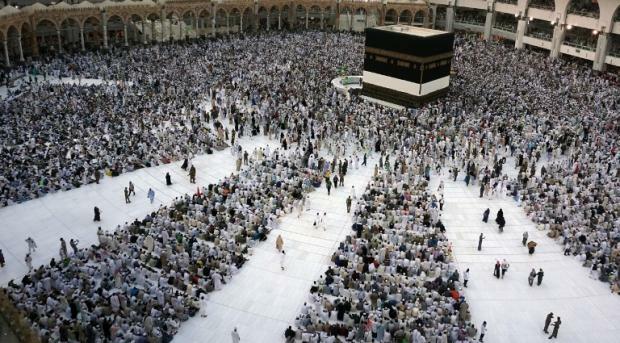 Saudi Arabia is barring more than one and a half million Palestinian citizens of Israel from travelling on temporary Jordanian passports to perform the Islamic pilgrimages of Hajj and Umrah in the holy city of Mecca, Middle East Eye can reveal. The measure is part of Saudi Arabia's new policy to stop issuing visas for Hajj and Umrah to Palestinians in Jordan, Lebanon, East Jerusalem, and, most recently, to Palestinians living in Israel, who hold temporary travel documents issued by Jordan or Lebanon - a policy that became effective on 12 September. This Saudi move affects 2.94 million Palestinians in total across these states, who have no access to any other form of travel document allowing them to go to Saudi Arabia, where millions of Muslims travel each year on pilgrimage to the holy cities of Mecca and Medina. Several travel agents spoken to by MEE in Israel, East Jerusalem and Jordan said that they were informed by Jordan's Ministry of Awqaf and Islamic Affairs that the Saudi embassy in Amman told them to not apply for visas for anyone seeking to travel to Mecca on a temporary Jordanian passport. A Jordanian source, with an inside knowledge of his country's diplomatic affairs, told MEE that the Saudi decision is part of a bilateral agreement with Israel to put an end to the "Palestinian identity and the right of return for refugees". "Saudi Arabia is pressuring Jordan to naturalise the Palestinian refugees in Jordan, Palestinians in East Jerusalem, and now Palestinians in Israel. The same could happen in Lebanon. Then, you will not have a Palestinian refugees problem," the source said. "It is all part of a bilateral agreement between Israel and Saudi Arabia. But Jordan is refusing to naturalise Palestinians." Jordanian MPs told MEE that Jordan has been issuing temporary travel documents since 1978 for Palestinian citizens of Israel, who fell under Israeli military administration after the 1948 Arab-Israeli war. Saud Abu Mahfouz, a Jordanian MP, said that they have asked Jordan's minister of interior and the minister of Awqaf to send a committee to Riyadh, the Saudi capital, to negotiate a reversal of the policy, and called upon King Salman to intervene. "The decision is affecting every Arab and Muslim who has the right to worship. We have been hearing complaints about this matter since last year, and we were surprised to find almost 200 tourist companies in Jordan not able to issue an electronic visa for Umrah from the Saudi embassy for Palestinians," Abu Mahfouz said. Another Jordanian MP, Yahya Al-Saud, said that they have asked for a meeting with the Saudi ambassador in Amman, Khaled bin Faisal, but the embassy has yet to set a date for the meeting. "There is a pressure on Jordan. The Saudi are saying that only people with permanent passports could get a visa for Hajj and Umrah," he said. Prior to 1978, Palestinian citizens of Israel endured three decades without going to Hajj and Umrah, a situation that ended when Jordan's King Hussein began a policy in coordination with the Arab League to issue travel cards for them to perform Hajj, one of Islam's five pillars. After 2000, Jordan's Civil Status and Passports Department in Amman started issuing them temporary passports instead of travel cards that are valid for a year and cost 50 Jordanian dinars ($70). Saudi Arabia and the majority of Arab states do not recognise the Israeli passport. The Jordanian temporary passport was a tool to facilitate Hajj and Umrah pilgrimages to Mecca for Palestinian citizens of Israel who hold an Israeli passport. 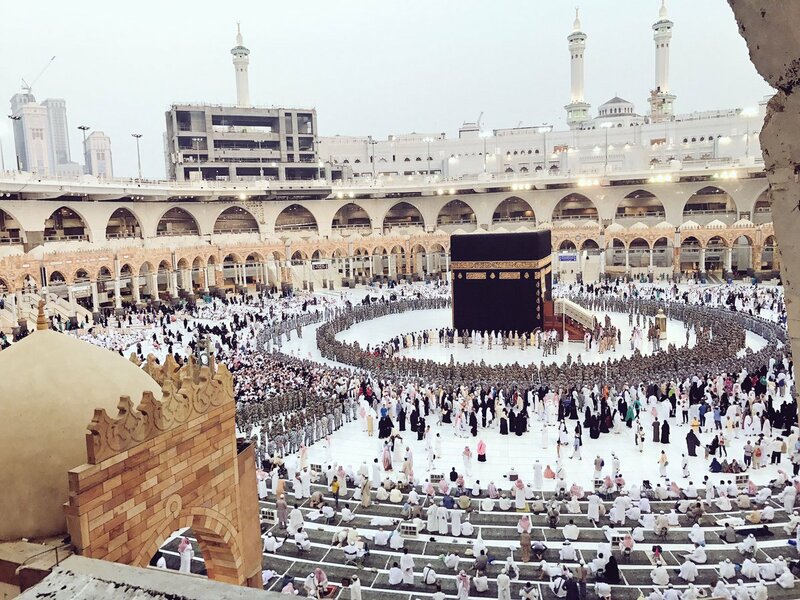 "Since 1978, we were just allowed to go to Hajj, but in the 1990s Saudi Arabia allowed us to go to Umrah [also]," Saleem Shal'atah, the head of the Hajj and Umrah Committee for Muslims of 48 that organises the journeys to Saudi Arabia, told MEE. Shal'atah said that he and two of his colleagues were denied a visa by the Saudi embassy in Amman on their Jordanian temporary passports, Jordan's Ministry of Awqaf and Islamic Affairs told them last month. "We were going to check the hotels and other travel arrangements for the new season of Umrah that starts on 16 December, as we do annually, but no visas were issued," he said. Shal'atah said that Palestinian citizens of Israel have to deposit their Israeli passports at the border point with Jordan and continue their journey to Saudi Arabia. Upon their return, the Jordanian authorities will take the Jordanian temporary passports, which is valid for just one journey, and hand them over the Israeli passports at the border. There are 4,500 Palestinian pilgrims from Israel who go to Hajj each year, Shal'atah said, and between 20,000 to 25,000 perform Umrah. 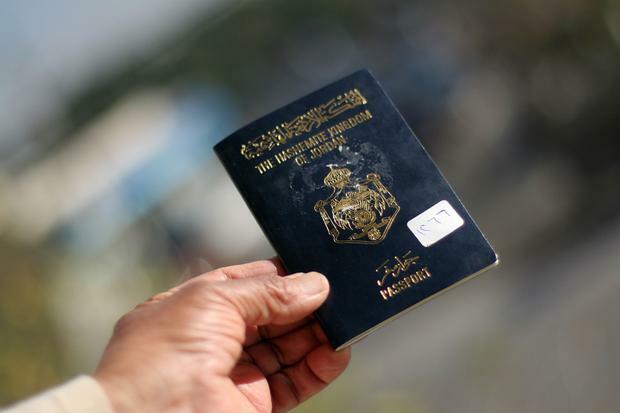 MEE reported in September that Saudi Arabia had banned Palestinians holding temporary Jordanian passports from entering the country, a measure directly affecting almost 634,000 Palestinians living in Jordan and 324,000 in the Israeli-occupied East Jerusalem. In October, MEE reported on another decision by the Saudi embassy in Lebanon to bar Palestinian refugees entry visas for Hajj and Umrah on their refugee travel documents. 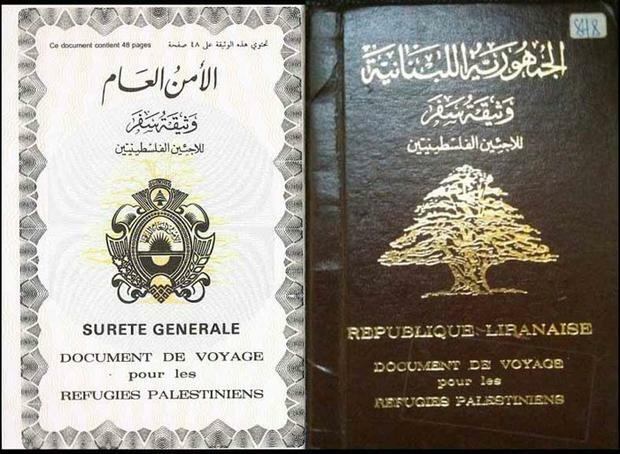 An official at the Saudi consul's office in Beirut confirmed to MEE then that following a decision by the Saudi Foreign Ministry in Riyadh, they had informed tourism companies in Lebanon that no Hajj and Umrah visas would be issued to Palestinians on their refugee travel documents - a decision that became effective on 12 September. Ashraf Dabbour, the Palestinian Authority ambassador in Beirut told MEE that the embassy knew about the Saudi visa decision through unofficial channels and word of mouth from Palestinian local figures. Palestinian refugees in Lebanon are estimated to number 174,422, according to the country's first and only census of the community in December. They can apply for a Lebanese travel document that is valid for one, three or five years, and the application fees are similar to that of the Lebanese passport, which costs $40 for each valid year. Palestinian refugees in Lebanon have no political rights of citizenship to vote in elections for parliament or local municipalities. Haaretz reported that the new Saudi visa ban for Palestinian citizens of Israel is aiming "to examine the possibility that Muslim citizens of Israel could travel directly to Saudi Arabia, as part of the growing detente between Israel and Saudi Arabia." Israel Katz, Israel's minister of transport, tweeted on 11 September welcoming Trump's "initiative" regarding the issue of Palestinian refugees, saying that the Palestinian refugee "problem" in Jordan, Syria, Lebanon and Iraq "would be good to disappear from the world".